Hinduism is most peaceful religion. Hinduism says No violence against Human and animal beings. Lord Buddha who is considered an avatar of Bhagwan Vishnu says not to kill the animals, It's a sin to kill animals. But a question arises if an animal attacks will we kill it? For self defence or to save others we must kill them if they attack. But if they don't attack we must not kill them. * Cow killers and cow eaters are condemned to rot in hell for as many thousands of years as there are for each hair on the body of every cow they eat from. *In the Rig Veda X.87.16 we find: One who partakes of human flesh, the flesh of a horse or of another animal and deprives others from milk by slaughtering cows ; if such a fiend does not desist then even cut off their heads by your powers Oh king. *In the Manu-samhita, chapter 4, verse 162 we find: A guru, a teacher, a father, a mother, a brahmana, a cow and a yogi all should never be killed. *In the Mahabharata, Anusasana-parva, 114.6, 115.6 it states: As the footprints of all moving, living beings are engulfed in those of the elephant, even thus all religions are to be understood byahimsa which is non-violence to any living being by thought, words or actions. *In the Srimad Bhagavatam, Canto 11, chapter 5, verse 14 we find: Those who are ignorant of the absolute truth and believe they are virtuous although wicked and arrogant who kill animals without any feeling of remorse or fear of punishment are devoured by those very same animals in their next birth. * Those who feed on human, horse or animal flesh and those who destroy milk-giving Aghnya cows should be severely punished. * Do not kill cows and bulls who always deserve to be protected. * In Rigveda cow slaughter has been declared a heinous crime equivalent to human murder and it has been said that those who commits this crime should be punished. * The Aghnya cows – which are not to be killed under any circumstances– may keep themselves healthy by use of pure water and green grass, so that we may be endowed with virtues, knowledge and wealth. If other people from different religion kill cow and offer a Hindu to eat beef, It must not acceptable. Because In Holy Rig Veda it declares straightly not to eat beef. Protect the cows. Now science has proved eating beef has a lot of health risks. Like Hearth diseases, Fat, Blood pressure. Hinduism says eating beef brings roughness in Human behaviour. Science has also proved this. Even now many non-Hindu do not eat Beef. 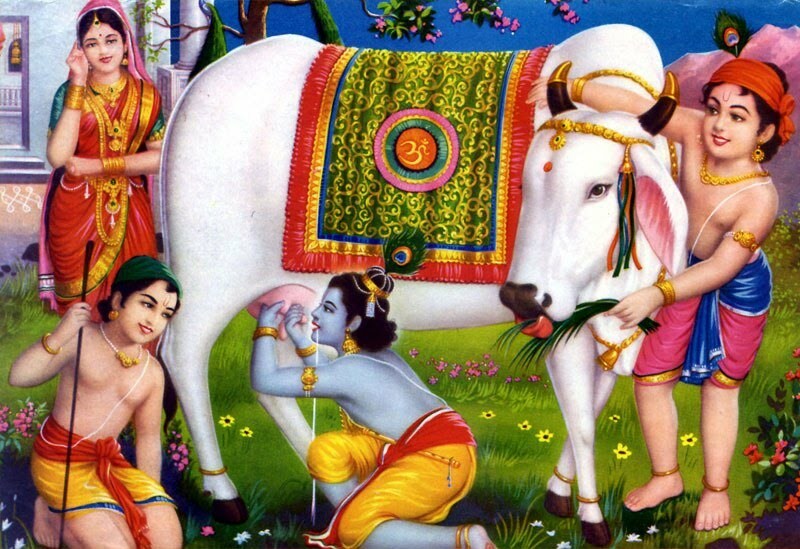 No more cow slaughter, Let us save this beautiful creation of Supreme Lord.